Brinno is glad to release new concept for IFSEC2015. Caller ID for your font door peephole! What is Caller ID? it is a telephone service,the call is being identify but before you answered. Before you open door! You can check before you open dooror Sensor detect to preview, 100% DIY setup and Seniors Friendly. 4F, No 107, Zhou-Zhi St.
2015 newest Brinno 14 months Battery Powered Outdoor Security Camera MAC200DN release. To ask if there is no power supply, no wifi area like outdoor, how can we cover security when all wire CCTV, IP Cam survelliance are not workable. 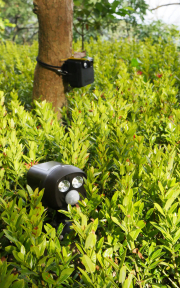 Brinno Portable Outdoor Security Camera MAC200DN is your last security mile choose.